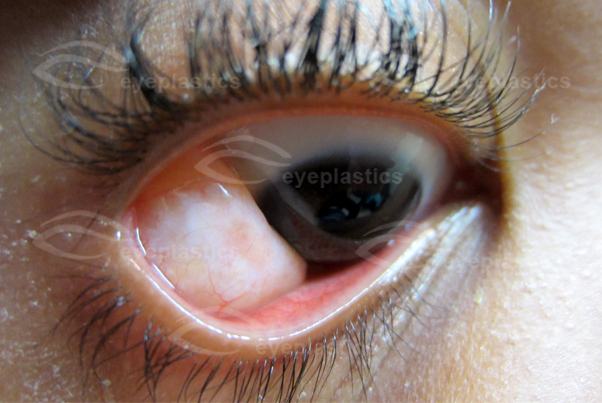 Skin over eye (no lids or palpebral fissure) that frequently blends in with the cornea which is usually malformed. Fusion of part or all lid margin: variant: Ankyloblepharon filiforme adnatum in which the lid margins are connected by fine strands. Enlargement of the lateral part of the palpebral aperture with downward displacement of the temporal 1/2 of the lower lid. 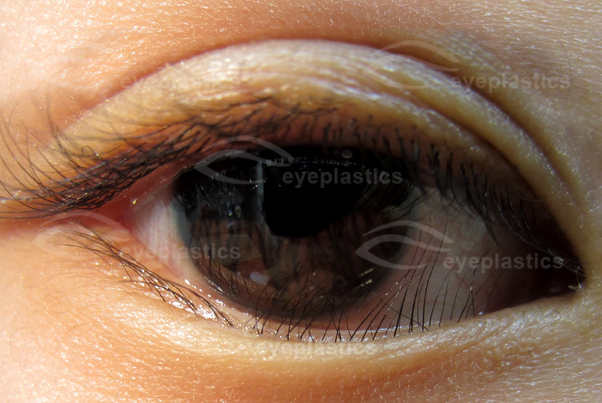 Palpebralis: If the fold is equally distributed in the upper and lower eyelids. When should the Ptosis be repaired? Lipodermoids are epibulbar, developmental growths of normal adipose in an abnormal site, ie. near the lacrimal gland and extending between the superior rectus and lateral rectus muscles posteriorly. Differentiation of benign lipodermoids from non-benign lesions is essential. When other ocular anomalies or systemic conditions are found in conjunction with lipodermoids then Goldenhar-Gorlin syndrome must be considered.